At each sunset, we sat on the deck of our beach front property at Strong Man's Cove, watching the magnificent colors glimmer off the ocean glass. We jumped out of our chairs as soon as we heard the screams. A small framed woman with flowing black hair was running from a dark haired man. Before I could make a move to help this poor woman, the man caught her and they both fell to the sand and began to struggle. I watched agape at the scene unfolding in front of me. He then began passionately kissing her and it became obvious she was returning this passion. I was stunned and confused. What was I seeing? Then my eyes caught sight of the camera man and a group of people. They walk up to the couple and exchanged some words I wasn't privy to hear. They all walked off the beach leaving us, once again, to watch the setting sun and me thinking, how we are all actors in a movie of our own making. Thank you to momtheobscure for our photo prompt this week! 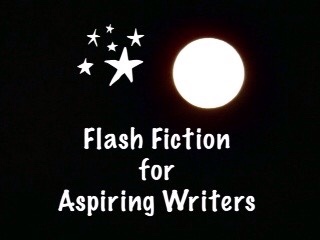 This is my 175 word submission for the flash fiction challenge, Flash Fiction for Aspiring Writers. 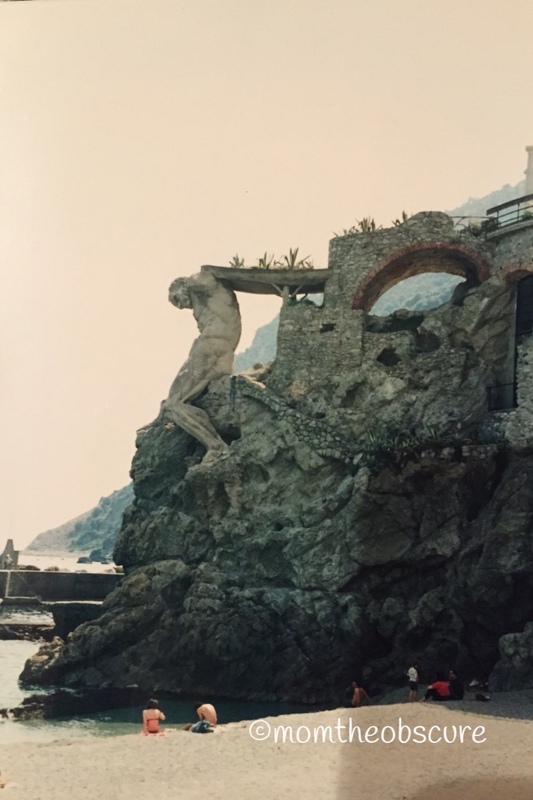 We are given a photo prompt and approximately 75-175 words with which to create our stories. Everyone is invited to participate. For more information, click HERE. Thank you so much YS!! “how we are all actors in a movie of our own making.” ~> I love this line. What a perfect line to end your story and what a strong line by itself as well. It’s so true, isn’t it? We are all actors starring in our own movies. Yes, it is true! LOL! Thank you for the kind comments! You rocked it with the last line PJ! Bravo! Thank you so much, Jodi! I’m glad you liked it! Very true. It kind of reminded me of that famous scene in From Here to Eternity where the couple is kissing on the beach so I couldn’t figure out if the actual movie had started yet. Great story. Thank you, Jenn! 🙂 I haven’t seen that movie. I know, that would have been frightening to go over and help but I think that is the first thoughts when someone is in trouble like she thought she was. Thank you so much, Yinglan! If she was really in trouble, that would had been my first thought too. Then my second thought would have been the same as yours. NO WAY! Hahaha! Thank you Ali! Yes, it’s a good thing she didn’t call the police! That would have been awkward! LOL! A very profound ending. It would be weird to see that and think, ‘oh, they’re just shooting movie.’ But you are very right we are all playing roles in our own lives. Shakespeare said: ” All the world’s a stage, and all the men and women merely players: they have their exits and their entrances; and one man in his time plays many parts, his acts being seven ages.” Same or similar to what you say 🙂 Nice write. I think he was referring to different stages in a person’s life. You’re welcome. I’m not 100 percent sure but it’s what I think 🙂 Have a great day PJ! Well, it sure does make sense! You have a wonderful day too, Mandi! Oh and thank you so much! That was seriously funny and a great line to end it! Enjoyed! Thank you so much, Keith! I appreciate that! I am much better looking in the movie of my own making. Very entertaining story, PJ. Thank you Emilio! I am beautiful in my movies! LOL!! Thank you so much Michael! You are right – all the world is a stage. I would like to redo my movie. LOL! You are right, Michael. I hope tomorrow I get to go in with foresight instead of ending up with hindsight! Haha! Haha! Thanks Michael! I need it! LOL! LOL! I’m so glad you enjoyed it! Yes, it’s a good thing it wasn’t a thriller after all. Ha! LOL!! Hahaha! I’m glad you liked it. Wow! Thank you so much!! I’m on cloud 9!! Thank you! I really do appreciate it. I get so discouraged sometimes because I feel my writing is so “lacking.” It feels good to get some positive feedback! Thank you for the sweet pep talk! LOL! I need it ever so often. As what they’ve said, you’ve perfectly wrapped the story with that last line PJ! Great job! This was a pleasure to read. 🙂 Haha. I guess he didn’t see that coming, did he? Thank you so much, Maria!! I am so glad you liked it! He sure didn’t see that coming. LOL! Thank you!! Hahaha! I can imagine his stunned and confused face when he saw those cameramen. 😀 My pleasure, PJ! This was a great one, up until the end I was waiting to see what happened. I really love the last line PJ! Thank you so much, Lynn! I am glad you liked it! It was fun, mysterious and insightful! Another great one PJ…yes, we all are actors in the films of our own making! Oh my, this is saucy. I had no idea where it was going. You can do a lot with 175 words. I’m happy to hear you are following me. I sure hope I don’t disappoint! Ahh, thanks! I’m glad I hooked you! LOL!! Loved this one, PJ! You had me hooked, too! Funny how different our perceptions are and how they can change on a dime! Thank you so muchTerri! I’m so glad you liked it. That is true, our perceptions can change in a flash! I have never been here. Momtheobscure loaned us this photo for our prompt. Thank you so much, Jessie! I am so glad that you enjoyed it. That is true, things can change so quickly and alter our perceptions. You are right. Often times our personal movies need editing! how we are all actors in a movie of our own making.” Great line! This was an emotional roller coaster – the relaxing beauty at the start – then danger- then suspicion and confusion – then it’s all over. The stuff of life. Thank you so much! I’m glad you liked it! 🙂 I have enjoyed your photo! That must be a very strange scene to witness. I love the last line. 🙂 Great story, PJ. Great take on the prompt, and I love the last line – we certainly are all actors in our own movies. Thank you so much for your kind comment! I really appreciate it. Another great story, and one that really fits in with the way we all respond so differently to what we see when we look at the photogra0h. That certainly was a good read. A steamy beach romance, only for the camera. I like the phrase that we are all actors in a movie of our own making. A fabulous write from the prompt. I enjoyed the anticipation of what was going on. “We are all actors in the movie of our making”, that is so true PJ. I love that line. Great job as always. Thank you so much Tania! Nice to see you! It has been and it is a stressful right now. Writing has been hard and here I am trying to get back into at least reading and catching up on some posts. Hopefully I can gather my thoughts to write a post. Hope you are well PJ. I’m sorry it is so stressful. Are you still getting ready to move? Yes and I am still undecided where to go and what to do. No wonder you are so stressed out. I would be too! I hope it all falls in place for you, Tania. Thank you Joy. I have 2 months to figure it out. I feel like I am sitting on a ticking time bomb. But hopefully things will fall into place and I can breathe and get on with life. Do you have any idea what you want to do? If you have a couple of months then hopefully, that will give you enough time to decide. I have way too many ideas and thats the problem 🙂 I am trying to narrow it down and hopefully I will figure something out soon, if not I will have a few more grey hairs. I have faith that you will figure it out and it will end up being the perfect solution for you! I hope so too. Thank you for your words of encouragement. My pleasure Tania, because I really do believe that. Thank you so much. I will write a post about whats going on. That’s great! I look forward to reading it. I am well, I hope you are too! !